The Blacktip Shark was recaptured 14 days later on December 15th, 2016 by Captain Fred David while fishing from the charter boat Frick and Frack out of Haulover Park, North Miami, Florida. 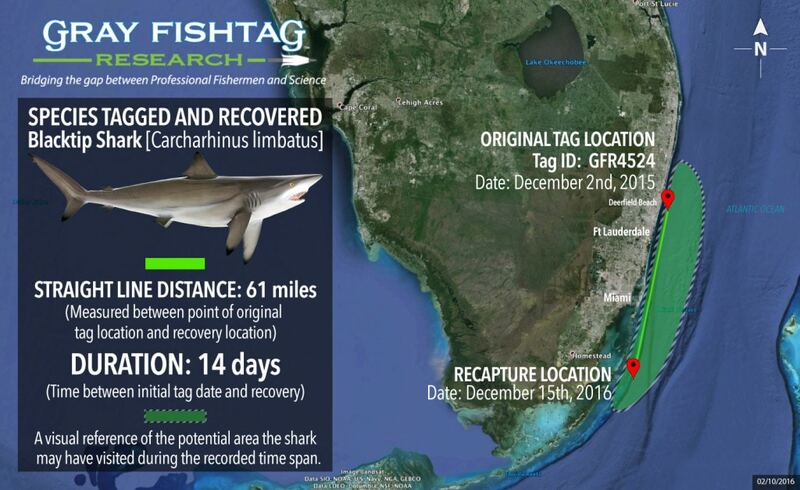 The shark was recaptured in the waters off southeast of Biscayne Bay, approximately 61 miles south of its original tag location. During that 14 day time period, the Blacktip Shark most likely stayed in the waters near the coral reef drop off that runs parallel to the Miami coast line. That habitat is home to numerous small schooling fish, which is the primary food source for the Blacktip Shark. At the time of recapture, the Blacktip Shark had an estimated length of 89 inches and weight of 200 pounds. Based on the length measurements, this Blacktip Shark was a mature and greater than 8 years old. After the tag information was recorded, the Blacktip Shark was subsequently released healthy and unharmed. Blacktip Sharks exhibit a dark gray/blue to a brownish color on their dorsal side and a white bottom side. The black tips are found on the ends of the dorsal fins, pectoral fins, pelvic fins, as well as the caudal lobe. The Blacktip Shark inhabits both inshore and offshore waters near shelf edges or drop offs. They are often found near bays, mangrove areas, estuaries, and river mouths, however they do not penetrate far into freshwater. The The Capt Mike charter boat crew will receive some Gray FishTag gear for their tagging efforts. Captain Fred David will receive a pair of Costa Del Mar sunglasses, a Tag & Recovery Certificate, and Gray FishTag gear for reporting the tag recovery.